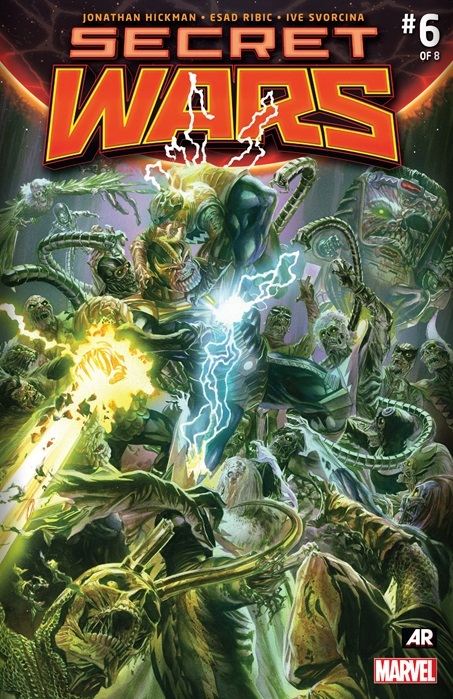 It has been Three Weeks after the events of Secret Wars #5. In Castle Doom Valeria and God Doom talk about their captives Proxima Midnight and Corvus Glaive. The Black Swan reveals some but not all the information that Doom seeks. At the foundation Valeria realizes that Drones are being sent out across the planet. Elsewhere Reed Richards and his counterpart the “Maker” wax philosophical about their plan to either neutralize or kill Dr. Doom. Peter Parker and Miles Morales make their way into Dr. Doom’s garden and run into Valeria. They make a deal after she gets some answers and in the white room they come face to face with the Molecule Man, the self styled source of Doom’s powers. In Castle Doom, God Doom meets with his Barons to seek aid in quelling a looming rebellion caused by the “Prophet”. Sinister meanwhile has seemingly converted Carol Danvers into a “sinister” and she is now in charge. Black Panther and Namor discover the Infinity Gauntlet and Thanos convinces Ben Grim who has served as the barrier/SHIELD of the realm to rebel thus leaving the kingdom open to the horrors from beyond. This issue had a few interesting developments. First on that list has to be Black Panther and Namor working together to locate what Dr. Strange has left for them in death. It turns out to be a powerful part of this puzzle….the Infinity Gauntlet…and one that works at the new Castle Von Doom. Handing the Black Panther such a weapon in such a high stakes crossover certainly continues Hickman’s upswing use of our African King. We Love it! Meanwhile all hell is breaking loose across the planet. The Black Swan is her usual devious self, spinning half truths for reasons only she really knows. Danvers/Sinister is such an unknown I don’t even know what to think. I’m also pretty sure this Prophet is really Inhuman prince Maximus. The Spider-men combo was a neat addition as Miles Morales continues to get proper front and centre treatment in the Marvel universe. I found the banter between the two Reeds particularly entertaining especially as the elder Reed came to realize that Doom stole his family. The art of Esad Ribbic is as beautiful as ever and well worth the long wait we had to endure. His style gives much needed weight to both the big and small moments alike.